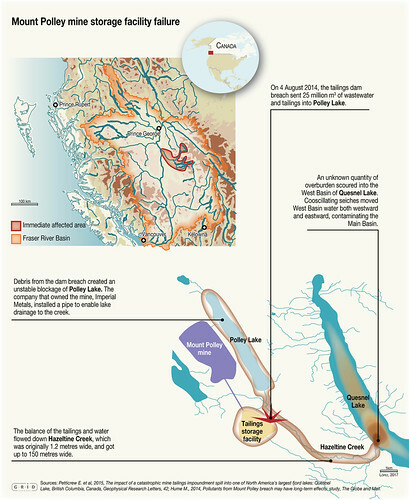 Tailings dam failure at the Mount Polley mine in Canada. The Mount Polley mine, a large, open-pit and underground copper-gold mine in British Columbia, began operation in 1997 and currently processes about 22 000 tonnes of ore per day. The mine’s tailings dam failed in August 2014, releasing approximately 25 million cubic metres of tailings and wastewater into a nearby creek (OAGBC 2016). Mine operations were suspended for a year following the breach and did not fully recommence until June 2016. The tailings storage facility (surface area approx. 2.4 km2 ) was designed with three embankments – the Main Embankment, the Perimeter Embankment and the South Embankment. These were constructed with a core built from excavated, fine-grained glacial till deposits, supported downstream by filter and rock-fill zones and upstream by a tailings/rock-fill zone. While the mine was in operation, the height of the embankments was increased in nine stages, to an eventual height of 40 metres. Shortly before the collapse, approval was being sought for Stage 10, which would have further increased the dam wall height (IEEIRP 2015). The Mount Polley dam failure created the largest environmental disaster in Canadian mining history (Schoenberger 2016). The mine is adjacent to Polley Lake and Hazeltine Creek, which flow into Quesnel Lake, one of the world’s deepest glacial lakes and an important commercial, recreational and aboriginal fishery. It supports sockeye salmon, rainbow trout and a diverse range of other fish species. Prior to the dam collapse, the water in the lake had a very low level of particulate material. 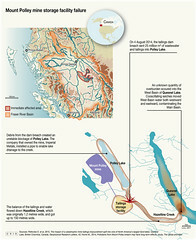 The collapse resulted in a massive sediment-laden plume scouring Hazeltine Creek and entering the west basin of the lake. Petticrew et al. (2015) monitored the lake for two months post-spill. They found increases in conductivity and temperature and a persistent, high-turbidity layer below the thermocline. While subsequent monitoring indicated that the turbidity reduced to near background level by the beginning of 2015 (SMA 2016), the full effects of the spill may not yet be apparent or easily identifiable.